Good work Bike Safe and VicRoads for providing this solution for riders. At the next intersection with Walter St, as cyclists come out of the service road they have diverted into there may be a problem with the 2 unbroken lines at the traffic island in the centre of the road. As you turn into Portarlington Rd/Ryrie St the access for bikes is good. It’s great that something has finally been done with this. It is very much like what we were hoping for. Totally agree with the proposed lane marking approaching the intersection. I’ve seen this done somewhere before. We need this in many places in the Geelong area. On highways in particular, we have a lot of bike lanes that disappear/change into a turning lane. The assumption might be that a cyclist stays in that lane, but legally they would need to change lanes to the right to the left most straight ahead lane if they wont to continue straight ahead. The sign on the wooden post is a bit contradictory. Sure, “Give way to pedestrians”, but “No bikes”??? 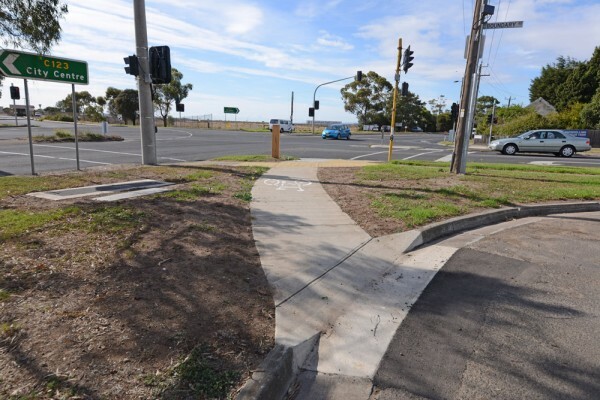 A better solution should have been found for where the service lane meets Walter St. Maybe a no right turn sign, with a bicycles excepted sign, for traffic exiting the service road?